Because ball heads are so useful and such a big part of my life, I am constantly on the hunt for better models. When Acratech offered one of their GP-s Ball Heads for evaluation, I enthusiastically agreed. All of Acratech's ball heads, with their machined-from-aluminum skeletal designs, have great looks, and this one does not break that norm. Especially attractive to me was the strength to weight ratio, rated to carry 25 lbs (11.4kg) at any angle while weighing in at only 14.94 oz (423.7g) (actual measured weight) in a compact package, including a base that measures only 2.08" (53mm). If it performed well, this head had potential to displace another head in my kit, a highly rated one that hasn't completely wowed me. Let's start this review with a look at the GP-s features Acratech thinks important. Next, let's take the Acratech GP-s Ball Head for a spin. Literally. Mouse over (or tap) the numeric labels under the product image to see a variety of views of this head. Starting in position 1, this head's primary features can be seen. The large knob on the left is the main locking knob. This relatively large knob is firm-rubber coated and works smoothly, rolling nicely in two fingers with the coarse ribs adding to the grip. The smaller knob to the right is used for setting the tension of the ball when the main knob is loosened. Loosen the main knob and set the tension as desired, then use the main knob to lock and unlock the ball. The rubber-coated knob on the bottom right is for locking the panning base. This knob feels like a smaller version of the main knob, but it requires more force to completely lock down and though captive, it has a small amount of play when loose. The panning base retains decent smoothness when nearing the fully locked state. The panning base itself has many finger groves, making it easy to grasp for installation and removal, taking pressure off of the panning base lock. Like most of the head's structure, the panning base is machined aluminum. Plenty of rotation markings are laser-etched onto the panning base and degrees in two orientations are laser-etched into the head above the panning base. The only problem might be remembering which panning base mark was the primary one being used. The tripod head's namesake ball is easy to see in the skeletal design and the open structure is easy to clean should that task become necessary. This maintenance free design needs no lubrication which also minimizes the need for cleaning. At the end of the ball stem is a wide-flanged area that locks into the clamp like a puzzle piece, leaving no chance for the clamp to rotate loose. I'll talk about the clamp more below, but it is of course all metal and has plenty of laser-etched positional markings. Image "3" shows the slimming view. It also shows the rubber O-ring on the tension knob. In image "5", the drop notch becomes visible. I think the other views are self-explanatory. 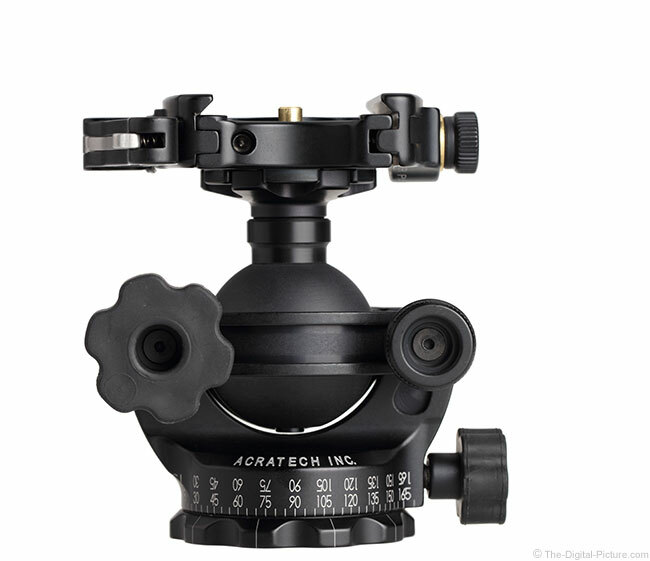 The clamp is an important part of a ball head and we'll first look at Acratech's list of their lever release clamp features. If the clamp is not Arca-Swiss standard compatible, I'm not interested. The universal (mostly) interoperability of the Arca-Swiss system has many benefits and most ball heads (even the latest from Manfrotto, one of the last holdouts) are now compliant. Being able to use a wide variety of plates, brackets and other accessories from a wide variety of manufacturers is important to me and you will find that at least most are compatible with this clamp. 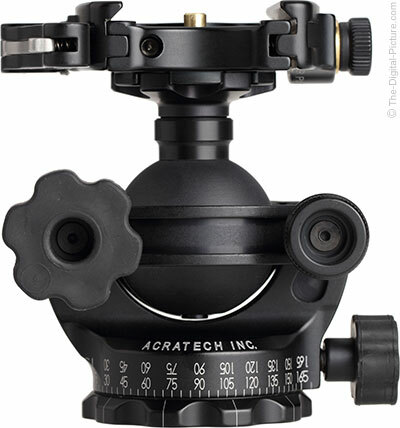 I have an Acratech GV2 Ball Head that I purchased before the lever release clamp was available. The standard quick release clamp (an option for this head), with its fast threads, works great, but I wanted to try the lever release. Part of the reason was that, when done right, I find lever releases are faster and easier to use and the other part was that not all lever releases are well designed. I wanted to see if Acratech got it right. The short answer is yes, Acratech got this design right. This is one of the nicest lever releases I've used. The width-adjustable clamp locks down tightly and holds the camera or lens plate solidly in place, taking care of the highest priority. Releasing the clamp is simple – squeeze the spring-tensioned metal lever lock against the black metal lever and open the clamp. It seems slightly strange for the lever lock to be the outermost surface on the lever when pulling it closed, but I have had no problems with the lock staying closed. It reliably works every time. Many lens and camera plates generally have a grooved/recessed center that will not slide out of this clamp due to the detent pin. However, the lever does not lock into an intermediate position that would promote fine tuning of the plate position and make the most use of this pin. If the lever is opened, the camera is supposed to come out of the clamp and it likely will if not being held in place. The lever can be held in an intermediate position to make the fine tuning available, but holding just the right tension is up to you. Having a large bull's eye level is nice, but ... it seems strange that this one is positioned under the camera. You can level the head before attaching the camera, but any changes made afterward cannot be verified without removing the camera. With newer cameras having electronic levels, this feature is not very important to me. However, there is a purpose for this level and it has to do with this lens' "leveling base for single row panoramics" feature that I ignored in the first feature set shared in this review. I had to watch a video to figure out what Acratech was talking about. This looks like a typical ball head with the standard features. How does it act as a leveling base? Turns out that the clamp must be unscrewed from the top and screwed onto the bottom, where the tripod would typically attach. The tripod then attaches where the clamp would normally attach. 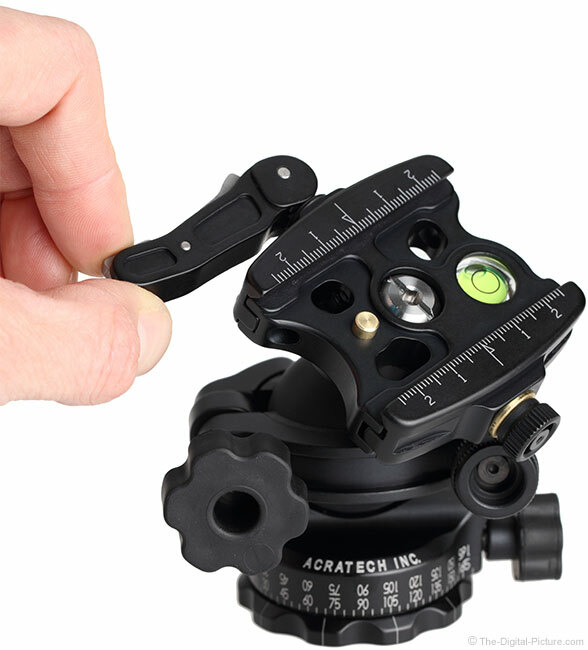 Upside-down, the ball head can be leveled, using the main locking knob in conjunction with the bull's eye level, and the panning base, now located immediately below the clamp, becomes the rotation mechanism. The feature is very creative. Will I ever use it? Especially with level-camera-only panorama potential, I'll more likely find myself leveling the tripod and using the panning base as usual (though precision ball alignment is not as easy using this method). But, we're not all the same and, there is certainly no detriment to having the feature available. Note that Acratech also has a slightly more compact version of this head, the GP-ss model. The GP-ss features a .5" (26mm) shorter quick release clamp (1.87" vs. 2.37" / 46mm vs. 60mm). It is easy to very quickly discern a great deal about a ball head's expected performance. You will find me at trade shows gripping ball head clamps and applying significant torque while tightening the locking knobs. In addition to a bruised palm, this test quickly gives me several key indicators of the head's expected performance. First, the test tells me the amount of main knob torque is required to completely lock up the ball. Some ball heads require very little pressure applied to the knob and others require very significant amounts of pressure with the ball never becoming completely locked (sorry to say that I've even broken a couple). The former is my strong preference and I am happy to report that the GP-s rates on that side of the scale. With the help of a relatively large locking knob relative to the size of the head, only a modest amount of force is required to lock the head. Second, this test tells me the overall strength of the head. As mentioned, some heads never completely lock and are limited to carrying lighter loads. To be fair, not all heads are designed for the type of load I'm applying, but with the weight (and cost) of DSLR gear, I'm not comfortable using a head that doesn't lock very tightly. The good news is that the Acratech GP-s Ball Head locks down very tightly. The third attribute this test makes clear to me is the smoothness of the ball as it becomes locked. Ideally, the ball continues to move very smoothly until the point where it locks completely, allowing precise adjustments until that occurs. On the other extreme, the ball begins to exhibit a nasty slip-stick action as it becomes tight, making precise adjustments only available only when the ball is not under any pressure. The GP-s has only a small/minor amount of slip stick behavior when close to locked. What about cold weather performance? Ball head operation is sometimes negatively impacted by cold temperatures, so I put this one in the freezer for some hours of chill time. The frozen head continued to perform as normal. The whole point of using a tripod and ball head is to hold the camera still while taking a photo (or photos) and to allow a scene to be framed perfectly. Right out of the box, I established that this head had the former issue covered and the make or break attribute remaining was to test the latter. I wasted no time in mounting a Canon EF 100-400mm f/4.5-5.6L IS II Lens to a Canon EOS 5Ds R and attaching it to the GP-s via a lens plate on the lens' tripod ring. I tightened the balanced camera and lens (set to 400mm) just enough to hold it in place and watched through the viewfinder as I tightened the lock knob. Much to my chagrin, I watched the camera's framing shift to the right more than I was comfortable with (though still much less than the high quality travel head that I was most wanting to replace). However, I discovered that the amount of framing shift declined with some pressure on the ball during initial framing. Tightening the small friction knob seems to reduce the framing shift and especially with short telephoto focal lengths and wider, the shift is barely perceptible and has not been an issue for me. At 400mm and longer, you may find the shift annoying. While I have successfully used lenses as large as the Canon EF 600mm f/4L IS II Lens) on the GP-s, a load well under the 25 lb (11.4 kg) rating, this lens seems really big for this tiny head and vibrations become slow to completely settle. A 400mm focal length from a Canon EF 100-400mm f/4.5-5.6L IS II Lens shows considerably less vibration and this is a more comfortable lens to use on this head. Really, a 600mm f/4 should be used on a gimbal head as the lens can tip the entire tripod over if the head is not adequately tightened. 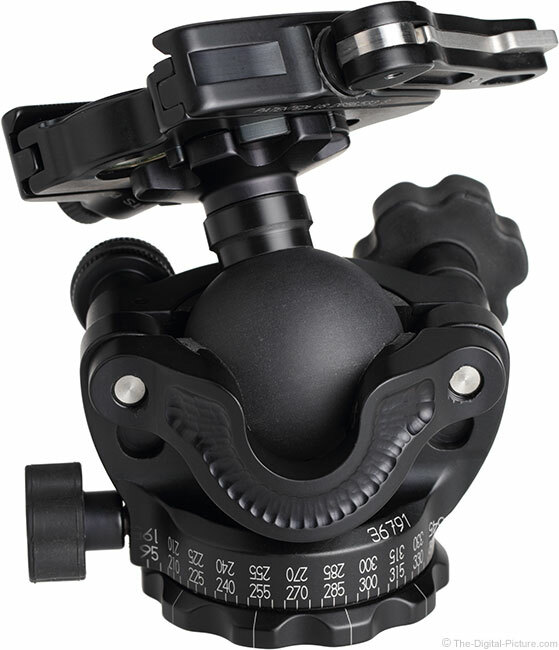 A gimbal head allows a lens to hang freely even with all locking knobs being loosened. 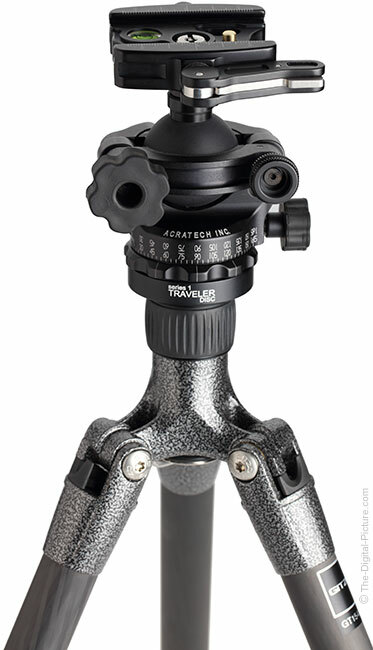 Really nice is that the Acratech GP-s has a built-in gimbal feature suggested for use with up to 400mm f/4 lenses. Simply put the ball neck down into the drop notch and ... you have a gimbal head. While it can be argued that all ball heads can be similarly used, the Acratech heads have a simple rotating plastic (Delrin?) collar around the ball neck that works smoothly in the drop notch. A pin, located at the bottom of the ball and visible in the primary product image shown for this review, provides support for the other side of the ball in this position. The gimbal arrangement worked very well with my 100-400mm lens at 400mm, allowing me to freely move and rotate the lens while following with subjects in action. I could remove my hands at any time without locking any of the moving parts, just as with a normal gimbal head. Note that when using the gimbal feature (or any time the drop notch is used), the load weight is unbalanced and care must be taken to insure overall stability of the tripod setup. Placing a leg directly under the weight of the camera is a good idea. I have used the GP-s on tripods ranging in size from the Feisol TT-15 Mini Tabletop Tripod to the Gitzo GT1542T Traveler 6x Carbon Fiber Tripod to the Gitzo GT3542LS Systematic 6X Carbon Fiber Tripod. 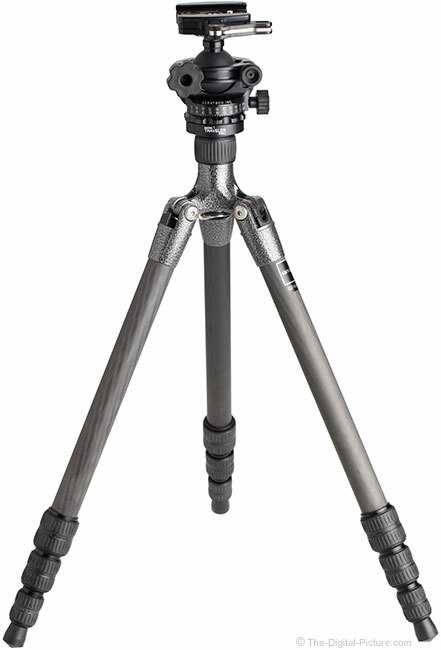 While it worked excellently over the entire range of tripod sizes, the GP-s seemed a bit undersized on the large Gitzo 3-Series tripod. 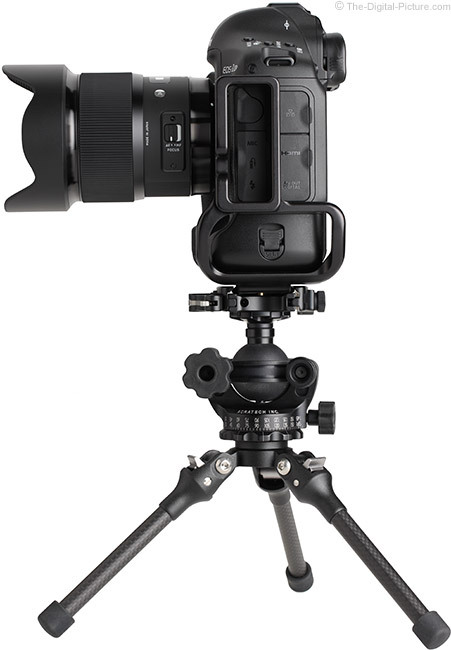 The GP-s seemed more logically suited/balanced for the tabletop tripod and especially right for the traveler tripod models as shown below. The 2-Series tripods would likely also sit well under this head. Below is the GP-s on a Feisol TT-15 along with a Zeiss Milvus 21mm f/2.8 Lens mounted to a Canon EOS 5Ds R.
While I love my Arca Swiss Z1 and it is a more-solid camera base, it seems oversized on the smaller tripods. Though the GP-s is not quite as rigid as the Z1, it is still quite solid and is considerably smaller and lighter. Those are two big reasons to select the Acratech model. That the Acratech model is more stylish than most other heads out there will interest some. If you are looking for a low-priced ball head, this is not it. While this head is not extremely high priced, a high quality machined aluminum and stainless steel ball head will not be a low cost support solution. 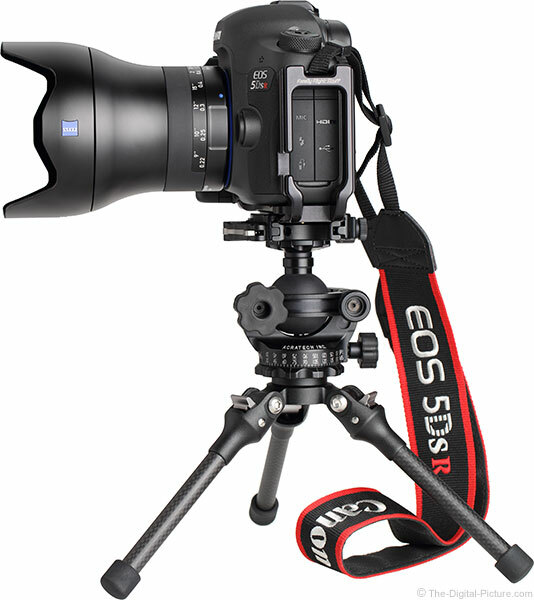 If you are mounting a quality DSLR camera to a tripod, it is not likely that a low cost solution is a good investment for you. 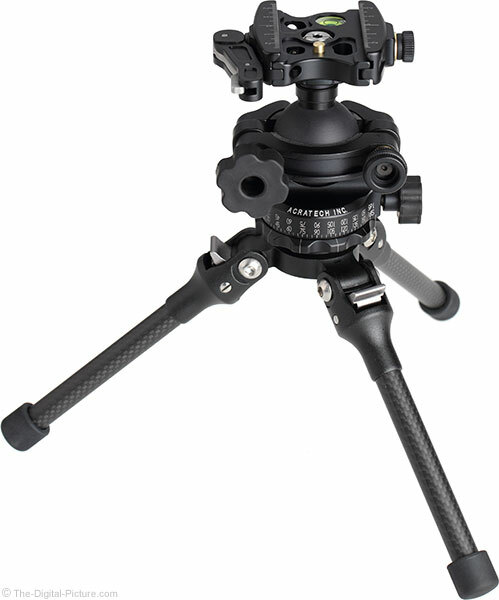 If you are looking for a high quality tripod head that will hold up for at least a decade (the warranty period) and likely much longer, this head is worth considering. Acratech GP-s Ball Heads are made in the USA. In addition to understanding why there are commonly bruises on my palms, hopefully you now have a good understanding of the Acratech GP-s Ball Head and the niche it fills. As mentioned, I already had a high quality travel head, but it struggled under weight of mid-sized telephoto lenses and it exhibited too much frame shifting when being locked down. The Acratech GP-s Ball Head is modestly larger and weighs about 3.5 oz (100g) more than my other head, but ... the performance advantages far outweigh these differences. I was looking for a better ball head for use on small and medium-sized tripods and this one handles that assignment nicely.